This 100% Kosher, all-polished Yemenite Shofar with its traditionally designed mouthpiece is easy to blow. 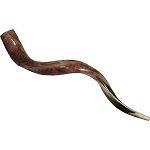 The classically handcrafted Shofar is absolutely ideal for any special Jewish occasion, especially the High Holiday season. Size: 81-86 cm / 32-34 inch.